The Department of Police, Fire and Emergency Management (DPFEM) is committed to the aims and objectives of the Public Interest Disclosures Act 2002 (the Act). It does not tolerate improper conduct by its employees, officers or members, or the taking of detrimental action against those who come forward to disclose such conduct. The Department of Police, Fire and Emergency Management recognises the value of transparency and accountability in its administrative and management practices, and supports the making of disclosures that reveal the type of conduct to which the Act is directed. The Department of Police, Fire and Emergency Management will take all reasonable steps to protect people who make such a disclosure from any detrimental action in reprisal for making the disclosure, and to protect their welfare. It will also afford natural justice to all parties involved in the investigation of a disclosure. These procedures establish a system for reporting disclosures of improper conduct or detrimental action by members, officers or employees of the Department of Police, Fire and Emergency Management. The procedures are also intended to assist its members, officers and employees to understand the way in which the Act operates and needs to be administered. Given the diverse roles within the Department, there are varying legislative provisions governing members’ conduct. State Service employees are subject to the State Service Act 2000, while police officers are dealt with under the Police Service Act 2003. Other legislation, including the Fire Service Act 1979 and the Emergency Management Act 2006, is applicable to specific roles. For clarification purposes, these procedures are also applicable to volunteer members with the Tasmania Fire Service and the State Emergency Service. The system created by these procedures provides for such disclosures to be made to the Principal Officer of the Department of Police, Fire and Emergency Management, that is, the Secretary of DPFEM, or to a delegated Public Interest Disclosure Officer. Disclosures may be made by people who are “public officers” with the Department of Police, Fire and Emergency Management. People who are, or have been, “contractors” with the Department for the supply of goods or services, can make disclosures to the Ombudsman or the Integrity Commission. The meaning of public officers and contractors is explained later in this document. These public interest disclosure procedures have been prepared in accordance with Guidelines and Standards published by the Ombudsman under s 38(1)(c) of the Act. These Guidelines and Standards can be seen on the Ombudsman’s website at www.ombudsman.tas.gov.au. These procedures are designed to complement normal communication channels between supervisors and employees. Employees are encouraged to raise concerns at any time with their supervisors; to use existing grievance processes; and where appropriate, to raise matters in line with applicable Code of Conduct procedures as outlined below. State Service Employee – Code of Conduct complaints made against State Service Employees employed within the Department of Police, Fire and Emergency Management, will be referred to the office of the Deputy Secretary, Business Executive Services. Upon receipt, an assessment will be made as to the manner in which the complaint will be dealt with. Employment Direction No. 5 was issued by the Minister on 4 February 2013 and sets out the – Procedures for the investigation and determination of whether an employee has breached the Code of Conduct. Tasmania Fire Service – Complaints in relation to the TFS or its members will be managed in line with the TFS Customer Service Charter. Complaints against the TFS may also be directed to the Ombudsman Tasmania or the Integrity Commission. The Act commenced operation on 1 January 2004. It was substantially amended by the Public Interest Disclosures Amendment Act 2009, following a major review of the Act, and these procedures reflect those amendments. The amendments took effect on 1 October 2010.
in the case of an investigation by a public body which results in a finding that the alleged conduct occurred, it obliges the public body to take action to prevent that conduct from continuing or recurring, and to take action to remedy any harm or loss which may have arisen (s 75). 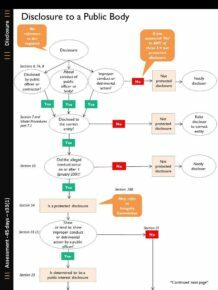 A flow chart, which depicts the way in which a public body should deal with a disclosure made to it under the Act, is at Attachment 1 to this document. It is important to note that a person does not have to expressly reference the Act when making a disclosure in order to be eligible for protection, if all the requirements in the Act are otherwise met. The Act and the Integrity Commission Act 2009 (IC Act) work very differently. Perhaps the most important difference is that the IC Act does not contain any provisions which protect a person who makes a complaint under that Act from detrimental action by way of reprisal. The provision of such protection is a key feature of the Act. the different processes which each Act applies to a matter brought forward under it. A person who is trying to decide which Act to proceed under should consider seeking legal advice on what is the best course for them to take. It is possible for a disclosure which is made under the Act to be dealt with under the IC Act – see Part 4A of the Act. may disclose that improper conduct or detrimental action in accordance with this Part. Because of the way that the expression “improper conduct” is defined in s 3 of the Act, a further expression is also very important. This is the expression “corrupt conduct”. Each of these expressions is now explained. (ii) over which the Government or a Minister exercises control. (e) any other prescribed body. (f) any other prescribed person. The Department of Police, Fire and Emergency Management is a “public body”, as so defined. Further, any member, officer or employee of the Department of Police, Fire and Emergency Management is a “public officer”, as so defined. Note that the right which s 6 of the Act gives to a public officer to make a disclosure must be exercised whilst the person is still a public officer. It is not a requirement that a public officer refer to the Act, or even have knowledge that the Act exists, to make a disclosure which may be protected under the Act. This definition has the effect that a person may exercise the right given to a contractor by s 6 of the Act even though the contract which they held with the public body is now over. Note that contractors cannot make a protected disclosure to a public body and should be referred to the Ombudsman or Integrity Commission. To avoid a speeding fine a police officer or firefighter declares that they were responding to an emergency call, when this was not the case. A DPFEM member is presented with an expensive gift from a supplier and the member fails to declare the gift. A member provided with a work vehicle for operational purposes uses that vehicle for non-work related purposes, without authorisation, on a regular basis. A forensic scientist advises a family member that their DNA has been found at a crime scene. (1) A person must not take detrimental action against a person in reprisal for a protected disclosure. Fine not exceeding 240 penalty units or imprisonment for a term not exceeding 2 years, or both. (b) the person incites or permits another person to take or threaten to take the action for either of those reasons. (3) In determining whether a person takes detrimental action in reprisal, it is irrelevant whether or not a reason referred to in subsection (2) is the only or dominant reason as long as it is a substantial reason. The effect of s 19 is that reprisal must have been a substantial reason behind the detrimental action taken, though other reasons may exist. discrimination against the discloser or his or her family and associates in applications for jobs, permits or tenders. Hence, disclosures which relate to improper conduct or detrimental action by a member, officer or employee of the Department of Police, Fire and Emergency Management must be made as explained in parts 7.2 to 7.6. A contractor, or a member of the public under s7A of the Act, can only make a disclosure about a public body, so they must make it to the Ombudsman or the Integrity Commission. 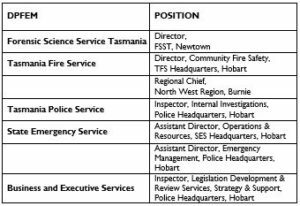 Each person who holds or acts in any of the following positions within the Department of Police, Fire and Emergency Management has been appointed by the Principal Officer to act as a Public Interest Disclosure Officer, and holds a delegation in accordance with s 62B of the Act. Where a person is contemplating making a disclosure and is concerned about approaching the Principal Officer or a Public Interest Disclosure Officer in the workplace, he or she can call the relevant officer and request a meeting at an alternative location. It is not a requirement that the person contemplating making a disclosure refers to the Act, or is aware of the Act, to make a valid disclosure. A disclosure about the Principal Officer or the Department of Police, Fire and Emergency Management should be immediately referred to the Ombudsman or the Integrity Commission. 7.5 To which entity should a disclosure be made? As can be seen from part 7.1 of these procedures, there are some situations in which a disclosure may only be made to a single entity. For instance, if the disclosure is about a councillor in a local council, it must be made to the Ombudsman. Where there is a choice of entities, those choices will include the Ombudsman and the Integrity Commission. Either of those entities will be able to give advice on the most suitable entity to receive the disclosure, but the Ombudsman has overall responsibility for the administration of the Act. the seriousness or otherwise of the disclosure. Note that if the disclosure is about the Department of Police, Fire and Emergency Management (i.e. the public body, not a public officer), it can only be made to the Ombudsman or the Integrity Commission. Given the normal functions of the Integrity Commission focus on individual misconduct it is recommended that the Ombudsman be contacted in the first instance. a disclosure about a police officer must be made to the Commissioner of Police. This part explains the roles and responsibilities of individuals within Department of Police, Fire and Emergency Management under the Act. Members, officers and employees of the Department of Police, Fire and Emergency Management are encouraged to report known or suspected incidences of improper conduct or detrimental action under the Act, in accordance with these procedures. All members, officers and employees of the Department of Police, Fire and Emergency Management have an important role to play in supporting those who have made a legitimate disclosure. They must refrain from any activity that is, or could be perceived to be, victimisation or harassment of a person who makes a disclosure. Furthermore, they should protect and maintain the confidentiality of a person they know or suspect to have made a disclosure. providing access to confidential employee assistance programs and appropriately trained internal support staff for those involved in the process. The Principal Officer may delegate many of his or her functions to a Public Interest Disclosure Officer. A Public Interest Disclosure Officer is appointed by the Principal Officer under s 62A(2) of the Act, and holds a delegation from the Principal Officer which enables him or her to exercise the statutory powers and functions given to the Principal Officer by the Act which are listed in their instrument of delegation. These procedures frequently give responsibilities or functions to a Public Interest Disclosure Officer. Not all of these are referable to specific statutory powers or functions bestowed on the Principal Officer by the Act, and so some of them represent things which the Public Interest Disclosure Officer is expected to do on a purely administrative basis. taking all necessary steps to ensure that the identity of the discloser and the identity of the person who is the subject of the disclosure are kept confidential. Where the Department of Police, Fire and Emergency Management has determined that a disclosure is a public interest disclosure, or where the Ombudsman has referred a disclosed matter to DPFEM for investigation, the Principal Officer will appoint an investigator to investigate the matter in accordance with the Act. An investigator may be a person from within the public body or a consultant engaged for that purpose. so far as is practicable, protect the identity of the discloser in the course of carrying out these responsibilities. A welfare manager may be a person from within the public body or a consultant engaged for that purpose. The Department of Police, Fire and Emergency Management will take all reasonable steps to protect the identity of a discloser. Maintaining confidentiality is crucial in ensuring reprisals are not made against the discloser. All reasonable care should also be taken to protect the privacy of witnesses and of the person against whom the disclosure has been made. Section 23 of the Act requires any person who receives information due to the handling or investigation of a protected disclosure, not to disclose that information except in certain limited circumstances. Disclosure of information in breach of this section constitutes an offence that is punishable by a maximum fine of 60 penalty units or six months imprisonment, or both. in proceedings for certain offences in the Act. However, the Act prohibits the inclusion of particulars in any report or recommendation that is likely to lead to the identification of the discloser. The Act also prohibits the identification of the person who is the subject of the disclosure in any particulars included in an annual report made in accordance with Part 9 of the Act. the investigating body believes that the disclosure of the identifying information is necessary for the matter to be effectively investigated. In both circumstances, the person who made the disclosure should be informed as to this step. The Department of Police, Fire and Emergency Management will ensure that all relevant files, whether paper or electronic, are kept securely and can only be accessed by the Principal Officer, Public Interest Disclosure Officer/s, the investigator, and (in relation to welfare matters only) the welfare manager. All printed material will be kept in files that are clearly marked as confidential, and all materials relevant to an investigation, such as tapes from interviews, will also be stored securely with the files. Care should also be taken to ensure that all relevant phone calls and meetings are conducted in private. Section 90 exempts documents from release under the Right to Information Act 2009 to the extent that they contain information regarding a disclosure, or information that is likely to lead to the identification of the person who made the disclosure or the person who is the subject of the disclosure. any recommendations made by the Ombudsman that relate to the Department of Police, Fire and Emergency Management. 11.1 What should the recipient of the disclosure do upon receipt of the disclosure? If the disclosure is oral, the recipient should make a file note as soon as possible, which records the time when the disclosure was made, the circumstances under which it was made and, so far as is possible, the exact words used by the discloser. The recipient should also ask the discloser to put the disclosure in writing as soon as possible. Unless the recipient is the Principal Officer (or the disclosure is about the Principal Officer), the recipient should immediately inform the Principal Officer of the disclosure, and should provide the Principal Officer with a copy of the disclosure, or record of the disclosure, and of any accompanying documents. If the disclosure is from a contractor, a member of the public or about the Principal Officer or Department of Police, Fire and Emergency Management, it should be immediately referred to the Ombudsman or the Integrity Commission. A file should be created for the disclosure, marked clearly as being a Public Interest Disclosures Act 2002 matter – see part 9 of these procedures (Confidentiality). 11.2 Assessing the disclosure – is it a protected disclosure? The protections provided by the Act to disclosers (contained in Part 4 of the Act) only apply where the disclosure made is a “protected disclosure”. This is defined in s14 as a disclosure made in accordance with Part 2 of the Act. As required by s 6 of the Act (see part 6.1 above), one of the preconditions to a disclosure being a protected disclosure, and therefore attracting the protections in Part 3 of the Act, is that it is made by a public officer or a contractor. Note that disclosure by contractors must be made to the Ombudsman or Integrity Commission. Note that an anonymous disclosure may be accepted if the person receiving it is satisfied that the disclosure is being made by a public officer or contractor (see s 8 of the Act). If the person is satisfied that an anonymous disclosure is from a contractor it should be referred to the Ombudsman. The person who carries out the assessment should inform the discloser as soon as practicable of their conclusion as to whether the disclosure is a protected disclosure, and of their reasons for coming to that conclusion. This should be done in writing. If the disclosure has been assessed as being a protected disclosure, the discloser should be given a copy of Part 3 of the Act, which details the protections which the Act provides. These protections should be explained to the discloser if necessary. The discloser should also be informed of the process which will be followed with respect to the disclosure. A copy of the assessment should also be given to the Principal Officer without delay, where the person who carried out the assessment is not the Principal Officer. If the disclosure is considered to be a protected disclosure, the Principal Officer or a Public Interest Disclosure Officer should immediately appoint a welfare manager to protect the interests of the discloser, and ensure that the discloser is advised of the name and contact details of that person (see parts 8.5 and 15.1). Section 7A of the Act provides that a person to whom a disclosure may be made under Part 2 of the Act may, if the person considers that it would be in the public interest to do so, treat any other person who is not a public officer or a contractor as a contractor for the purposes of the Act. Only the Ombudsman or the Integrity Commission can accept disclosures from contractors, so the person will need to be advised to contact either of those bodies. If the Public Interest Disclosure Officer considers this is applicable, they should seek advice from the Ombudsman. 11.3 Should the disclosure be referred to another body? The Department of Police, Fire and Emergency Management may refer a public interest disclosure to the Ombudsman if it believes that it is not able to complete the investigation satisfactorily (see s 68 of the Act). The Act does not provide for other relevant circumstances in which a public body may refer a protected disclosure to the Ombudsman before commencing an investigation, but an alternative way of achieving the same result would for the public body to encourage the discloser to make their disclosure direct to the Ombudsman, such that there is no need for the public body to continue to investigate the matter. The Department of Police, Fire and Emergency Management may refer a protected disclosure to the Integrity Commission where it considers that the disclosure relates to misconduct as defined in s 4(1) of the IC Act. The Department of Police, Fire and Emergency Management must notify the discloser of the referral within a reasonable time (unless the disclosure was made anonymously) under s 29D. The Integrity Commission may deal with the disclosure under the IC Act, or it may refer the disclosure to the Ombudsman or a public body, as the case may require, for action by the Ombudsman or public body in accordance with the Act. the views of the discloser as to whether referral should occur. In accordance with a Memorandum of Understanding between Tasmania Police and the Integrity Commission, Tasmania Police will notify the Integrity Commission in relation to serious misconduct involving a police officer of any rank, and any misconduct involving a commissioned police officer (Inspector or above). It is possible that, before or during an investigation, facts are uncovered that reveal the possibility of a criminal offence. If this happens, the Department of Police, Fire and Emergency Management will not commence, or will suspend, the investigation and will consult with the Ombudsman as to the future of the matter. Under section 41 of the Act, the Ombudsman has the power to refer a disclosed matter to the Commissioner of Police for investigation. 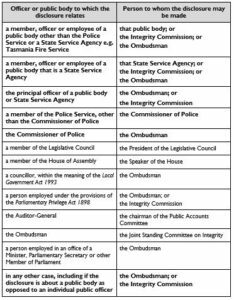 If the Ombudsman is satisfied that the disclosed matter should be referred to Tasmania Police, the Department of Police, Fire and Emergency Management should consider whether the disclosure should be referred to the Ombudsman under s 68 of the Act. Early referral of the matter may avoid interference with the evidentiary trail. Referral to the police through the Ombudsman will also avoid any question of a breach of confidentiality under s 23 of the Act. Once a disclosure is referred to the Commissioner of Police through the Ombudsman, the investigation under the Act ceases. However, there may still be administrative or operational issues which have been identified during the disclosure process or investigation that should be dealt with under other internal processes of the Department of Police, Fire and Emergency Management. The Principal Officer, or Public Interest Disclosure Officer acting in consultation with the Principal Officer, will decide how the matter should be dealt with. 11.4 Further assessment – Is the disclosure a public interest disclosure? Where the Principal Officer or Public Interest Disclosure Officer has received a disclosure that has been assessed to be a protected disclosure, the Principal Officer or Public Interest Disclosure Officer must make a determination under s 33 of the Act as to whether the disclosure is a public interest disclosure. This assessment must be made within 45 days of the receipt of the disclosure. has taken, is taking or proposes to take detrimental action in reprisal for the making of the protected disclosure. A disclosure must be more than a mere allegation without substantiation. A disclosure must include an indication of the existence of evidence that, if substantiated, would show or tend to show that the alleged conduct occurred. proceed to investigate the disclosed matter – see part 12 (Investigations) below – see s 34.
notify the person making the disclosure within 14 days of the decision (unless it is an anonymous disclosure) – see s 35. The Ombudsman must then review this decision under s 35(2). If, on review of the matter, the Ombudsman decides that the disclosure is not a public interest disclosure, the matter does not need to be dealt with under the Act. The Principal Officer, or the Public Interest Disclosure Officer in consultation with the Principal Officer, will then decide how the disclosure should be dealt with. If the Ombudsman determines the disclosure is not a public interest disclosure, but could be a complaint under the Ombudsman Act 1978 the Ombudsman must notify the discloser of his or her right to have the disclosure dealt with as a complaint under the Ombudsman Act if he or she wishes. If the Ombudsman determines that the disclosure is in fact a public interest disclosure, the matter may be referred back to the public body under s 42 for investigation under the Act or the Ombudsman will deal with the disclosed matter. 12.1 When does protection commence? Where the Department of Police, Fire and Emergency Management receives a disclosure which complies with the requirements of Part 2 of the Act, the disclosure immediately attracts the protections set out in Part 3 of the Act. This is so whether or not the disclosure is factually correct (although one of the requirements of Part 2, as found in s 6, is that the discloser honestly believes that the alleged improper conduct or detrimental action in fact occurred). The protection also extends to a person who intends to make a disclosure. Note that, as provided in s 9, a disclosure can still be made where the discloser cannot identify the person or body to whom or to which the disclosure relates. 12.2 What protection does the Act provide? Part 3 of the Act gives various types of protection to a person who makes a protected disclosure. This part of these procedures only provides a summary of some elements of that Part of the Act. does not by doing so breach an obligation by way of oath, or rule of law or practice, or under an agreement, which requires the discloser to maintain confidentiality or otherwise restricts the disclosure of information (s 17(1)(b)). These last two protections do not apply, however, to a disclosure of information to a person other than the person to whom the protected disclosure was originally made, unless that further disclosure was made in accordance with the Act (see s 17(2) of the Act). Part 3 also contains various provisions which are intended to protect a discloser from detrimental action by way of reprisal for a protected disclosure. By s 19, the Act makes it an offence to take such detrimental action. By s 20, it creates a liability to pay damages for such detrimental action. And by s 21, it gives a person who believes that detrimental action has been taken against him or her the right to apply to the Supreme Court for an order requiring the person who has taken the detrimental action to remedy that action, or for an injunction. The Department of Police, Fire and Emergency Management must investigate every disclosure referred to it for investigation by the Ombudsman under s 63(b). Unless the matters set out in 13.2 below apply, or the matter is referred to the Ombudsman, the Department of Police, Fire and Emergency Management will investigate every disclosure that it receives and determines is a public interest disclosure under s 33 of the Act (see s 63(a) of the Act). The Principal Officer will appoint an investigator to carry out the investigation. The investigator may be a person from within an organisation or a consultant engaged for that purpose. to maintain procedural fairness in the treatment of witnesses and generally to all parties involved in the disclosure. the matter which is the subject of the disclosure has already been determined and the additional disclosure does not provide significant or substantial new information. Any decision not to proceed with an investigation on a ground specified in s 64 must be made by the Principal Officer. If the Principal Officer determines that the disclosed matter is not to be investigated, notice of this fact must be given within 14 days to both the Ombudsman and (except in the case of an anonymous disclosure) the person who made the disclosure. Reasons for the decision must accompany the notice. One reason a disclosure about a police officer may not be investigated, is that it is to be investigated in accordance with the provisions of the Police Service Act 2003 and Abacus, concerning complaints against police. The Ombudsman is required by s 65(2) to review such a decision. Following the review, the Ombudsman must notify the Department of Police, Fire and Emergency Management of his or her decision within a reasonable time. If the Ombudsman on review determines that the disclosure should not be investigated, the matter does not need to be dealt with under the Act. The Principal Officer, or the Public Interest Disclosure Officer in consultation with the Principal Officer, will decide how the matter should be dealt with. If the Ombudsman determines that the disclosure should be investigated, and the matter is not referred to the Ombudsman for a reason specified in s 68, the Department of Police, Fire and Emergency Management must proceed with the investigation. The Principal Officer – not a Public Interest Disclosure Officer – will determine who is to carry out the investigation. As earlier indicated, this may be an officer within the Department of Police, Fire and Emergency Management or an external consultant. The investigator will be given formal terms of reference, signed by the Principal Officer. the resources available to the investigator for the purposes of the investigation. The completion date should be as soon as practicable but, in any event, not more than 6 months from the date of the determination that the disclosure is a public interest disclosure under s 77A(1). If at any stage before or during the investigation it appears that the investigation cannot be completed within 6 months, the Department of Police, Fire and Emergency Management may apply to the Ombudsman for an extension of up to 6 months in which to complete the investigation under s 77A(2). The investigator should prepare an investigation plan for approval by the Principal Officer. The plan should include the issues which are to be investigated and outline the investigative stages. The plan should be updated as necessary during the course of the investigation. The principles of natural justice must be carefully observed in the course of the investigation, with respect to all parties involved. These principles are sometimes referred to as “procedural fairness”. The principles are a set of procedural standards which need to be met if the right of a person to a fair hearing can be accepted as having been satisfied. The Department of Police, Fire and Emergency Management will comply with the following requirements in ensuring that procedural fairness is accorded to all parties involved. in respect of whom there is reasonable ground for apprehending or suspecting bias. If the investigator is aware of any reason why they may be susceptible to an allegation of bias on the basis of these principles, they should immediately inform the Principal Officer. the potential findings in view, and their possible consequences. This must be done before any final conclusions are formed by the investigator. Each such person must be given a reasonable time to respond to the material which is provided to them. The investigator must maintain an open mind, and must fairly take into account all representations which such a person may make. Note that there is no requirement to inform the person who is subject to the disclosure as soon as it is received, or as soon as the investigation has commenced. Note also that the name of the person making the disclosure or any particulars which might identify that person must not be revealed unless necessary, and with the discloser’s knowledge. The final investigation report should be drafted in a way that demonstrates that procedural fairness has been accorded. For instance, it should record and deal with all submissions and evidence which a person has put in their defence. A useful reference in planning and executing the investigation is the publication by the Australian Public Service Commission (albeit produced for a different purpose), Handling misconduct: A human resource manager’s guide (Second Edition, 2015. All information gathered in the course of the investigation must be securely stored. Interviews should be conducted in private, and the investigator should take all reasonable steps to protect the identity of the discloser. Where disclosure of the identity of the person cannot be avoided, due to the nature of the allegations, the investigator should warn the discloser and his or her welfare manager of this. Under s 68 of the Act, a public body may refer the investigation of a disclosed matter to the Ombudsman where the public body considers that its own investigation is being obstructed or that it is otherwise not within the capacity of the public body to complete the investigation. Any decision as to whether the investigation should be referred to the Ombudsman will be taken by the Principal Officer. See also part 11.3.3, concerning referral of an investigation to the Ombudsman, with a view to referral by the Ombudsman to the Commissioner of Police of suspected criminal conduct. The Principal Officer or the Public Interest Disclosure Officer must ensure that the discloser is kept regularly informed concerning the handling of a protected disclosure and an investigation. The Principal Officer must report to the Ombudsman about the progress of an investigation. Section 74 of the Act requires a public body, at the request of the Ombudsman or the person who made the disclosure, to give the Ombudsman or that person reasonable information about the investigation. The information must be given within 28 days of the request. the giving of the information would endanger the safety of another or may prejudice the conduct of the investigation. the findings made and conclusions reached, and the basis for them. Note in particular that the report should not include any comment adverse to any person unless that person has been given an opportunity to be heard in the matter and their defence is fairly set out in the report (see part 13.5 of these procedures). any action that should be taken by the Department of Police, Fire and Emergency Management to remedy any harm or loss arising from that conduct. The steps to be taken may include bringing disciplinary proceedings against the person responsible for the conduct, and referring the matter to an appropriate authority for further consideration. For example, if the investigation has revealed conduct that may constitute a criminal offence, consideration should be given to whether the matter should be referred to Tasmania Police, unless this has previously occurred. all documents, statements or other exhibits received by the officer and accepted as evidence during the course of the investigation. The report must not disclose particulars likely to lead to the identification of the discloser under s 23(2). 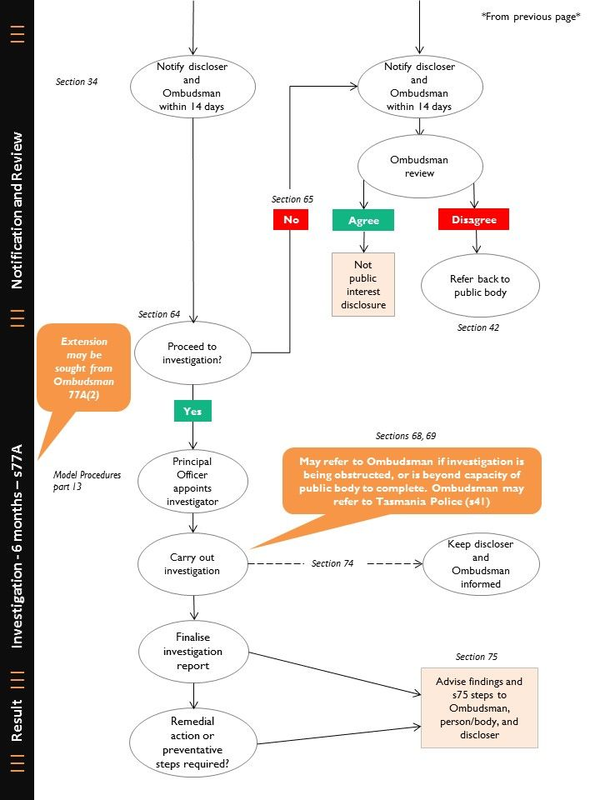 If the Principal Officer is satisfied that the conduct which was the subject of the investigation has occurred, he or she must consider the recommendations in the investigator’s report and decide upon the steps which are to be taken to prevent the conduct from continuing or occurring in the future under s 75(1)(a). Again taking into consideration any recommendations in the investigator’s report, the Principal Officer must also consider whether any action should be taken to remedy any harm or loss arising from the conduct under s 75(1)(b). Where the Public Interest Disclosure Officer is responsible for the progress of the investigation and is satisfied that the disclosed conduct has occurred, he or she will recommend to the Principal Officer the action that must be taken. The Principal Officer will provide a written report to the Minister for Police and Emergency Management and the Ombudsman, setting out the findings of the investigation and any remedial steps taken. Where the investigation concludes that the disclosed conduct did not occur, the Principal Officer will report these findings to the Ombudsman and to the discloser. As required by s 77 of the Act, the Principal Officer will also inform the discloser of the findings of the investigation, and of any steps taken under s 75 as a result of the findings made. The Department of Police, Fire and Emergency Management is committed to the protection of genuine disclosers against detrimental action taken in reprisal for the making of protected disclosures. The Principal Officer is responsible for ensuring that disclosers and witnesses are protected from detrimental action, and that the culture of the workplace is supportive of protected disclosures being made. The Principal Officer or the Public Interest Disclosure Officer must appoint a welfare manager to support all persons who have made a protected disclosure. See part 8.5 for the responsibilities of a welfare manager. The welfare manager must also provide advice about what the discloser should do if they believe that a colleague/s or a relative/s is being subjected to detrimental action. The advice will include what level of information it is necessary for them to provide. All employees will be advised that it is an offence for a person to take detrimental action in reprisal for a protected disclosure (s 19). The maximum penalty is a fine of 240 penalty units or two years imprisonment, or both. The taking of detrimental action in breach of this provision can also be grounds for making a disclosure under the Act and can result in an investigation. See part 6.5 for further details as to what constitutes detrimental action. and Emergency Management, they may report the matter to the Ombudsman. A report of detrimental action may qualify as a protected disclosure under the Act. The Principal Officer or the Public Interest Disclosure Officer must ensure that the discloser is kept informed of action taken in relation to his or her disclosure, and the time frames that apply. The discloser must be informed of the objectives of any investigation that takes place, the findings of the investigation, and the steps taken by the Department of Police, Fire and Emergency Management to address any improper conduct that has been found to have occurred. The discloser must be given reasons for all decisions made by the Department of Police, Fire and Emergency Management in relation to a disclosure. All communication with the discloser must be in terms that are easily understood. advise the Principal Officer of the detrimental action. The taking of detrimental action in reprisal for the making of a disclosure can be an offence against the Act as well as grounds for making a further disclosure. Where such detrimental action is reported, the Public Interest Disclosure Officer or the Principal Officer will assess the report as a new disclosure under the Act, and it will be dealt with accordingly in accordance with these procedures. Where a person who makes a disclosure is implicated in misconduct, the Department of Police, Fire and Emergency Management will handle the disclosure and protect the discloser from reprisals in accordance with the Act, the Ombudsman’s guidelines and these procedures. At the same time the Department of Police, Fire and Emergency Management acknowledges that the act of disclosing should not shield disclosers from the reasonable consequences flowing from any involvement in improper conduct. Section 18 of the Act specifically provides that a person’s liability for his or her own conduct is not affected by the person’s disclosure of that conduct under the Act. However, in some circumstances, an admission may be a mitigating factor when considering disciplinary or other action. The Principal Officer will make the final decision as to whether disciplinary or other action will be taken against a discloser. Where disciplinary or other action relates to conduct that is the subject of the person’s disclosure, the disciplinary or other action will only be taken after the disclosed matter has been appropriately dealt with. there are good and sufficient grounds that justify exercising any discretion to institute disciplinary or other action. The Public Interest Disclosure Officer or Principal Officer will thoroughly document the process, including recording the reasons why the disciplinary or other action is being taken, and the reasons why the action is not in retribution for the making of the disclosure. The Public Interest Disclosure Officer or Principal Officer will clearly advise the discloser of the proposed action to be taken, and of any mitigating factors that have been taken into account. The Department of Police, Fire and Emergency Management recognises that employees against whom disclosures are made must also be supported during the handling and investigation of disclosures. The Department of Police, Fire and Emergency Management will take all reasonable steps to ensure the confidentiality of the person who is the subject of the disclosure during the assessment and investigation process. Where an investigation does not substantiate a disclosure, the fact that the investigation has been carried out, the results of the investigation, and the identity of the person who is the subject of the disclosure will remain confidential. The Public Interest Disclosure Officer or Principal Officer will ensure that the person who is the subject of any disclosure investigated by or on behalf of the Department of Police, Fire and Emergency Management is accorded natural justice in accordance with part 13.5 of these procedures. Where the allegations in a disclosure have been investigated, and the person who is the subject of the disclosure is aware of the allegations or of the investigation, the Public Interest Disclosure Officer or Principal Officer will formally advise the person who is the subject of the disclosure of the outcome of the investigation. The Department of Police, Fire and Emergency Management will give its full support to a person who is the subject of a disclosure where the allegations contained in a disclosure are clearly wrong or unsubstantiated. If the matter has been publicly disclosed, the Principal Officer of the Department of Police, Fire and Emergency Management will consider any request by that person to issue a statement of support setting out that the allegations were clearly wrong or unsubstantiated. This provision makes it an offence for a person to take detrimental action against a person in reprisal for a protected disclosure being made. The section provides for a maximum penalty of a fine of 240 penalty units or two years imprisonment, or both. This provision makes it an offence for a person to disclose, except under specified circumstances, information which they have obtained or received in the course of or as a result of a protected disclosure or the investigation of a disclosed matter under the Act. The section provides for a maximum penalty of 60 penalty units or six months imprisonment, or both. This section creates various offences relating to obstructing the work of the Ombudsman under the Act, including offences relating to misleading the Ombudsman. The section provides for a maximum penalty of 240 penalty units or two years imprisonment, or both. This provision makes it an offence for a person to knowingly provide false information under the Act to certain officers (including the Ombudsman) with the intention that it be acted on as a disclosed matter. The provision provides for a maximum penalty of 240 penalty units or two years imprisonment, or both. This section makes it an offence for a person to knowingly provide false information to a person conducting an investigation under the Act. The provision provides for a maximum penalty of 240 penalty units or two years imprisonment, or both. The value of a penalty unit varies from time to time in accordance with movements in the Consumer Price Index. For more information, see the Department of Justice website. These procedures were approved by the Ombudsman under s 60(3) of the Act on 17 April 2018. Following advice received from the Principal Legal Officer, amendments were made to the procedures on 28 June 2018, essentially in relation to s 7 concerning who disclosures may be made to, and s 10 as it relates to publishing statistics. The procedures will be submitted to the Ombudsman for review at least once in each 3 year period to ensure they meet the objectives of the Act and accord with the Guidelines and Standards published by the Ombudsman under s 38(1)(c) of the Act. The date by which the procedures must be submitted to the Ombudsman for review is 17 April 2021. Note that s 7A of the Act permits a person to whom a disclosure may be made under Part 2 of the Act to treat a person who is not a public officer or contractor as a contractor for the purposes of the Act, if they consider that it would be in the public interest to do so. A disclosure by a contractor is not necessarily protected if made to a public body, so referral should be made to the Ombudsman or the Integrity Commission. The Act concerns “improper conduct”, which includes “corrupt conduct”. The IC Act concerns “misconduct” only and it is unclear as to the extent to which corrupt conduct would be able to be investigated. The definitions of these expressions used in the two Acts do not align. For apprehended bias, the test is whether a fair minded lay observer, taking into account all relevant circumstances, might reasonably apprehend that the decision-maker might not bring an impartial mind to the resolution of the questions that he or she is required to decide. Available online at http://www.apsc.gov.au/publications-and-media/current-publications/handling-misconduct-a-human-resource-managers-guide-2015/part-i-framework-for-handling-misconduct (current as at June 2017). This page -- https://www.police.tas.gov.au/about-us/public-interest-disclosure/public-interest-disclosures-act-2002-procedures-manual/ -- was last published on June 29, 2018 by the Department of Police, Fire and Emergency Management.